For all plastic injection molding jobs it’s important to control heat. 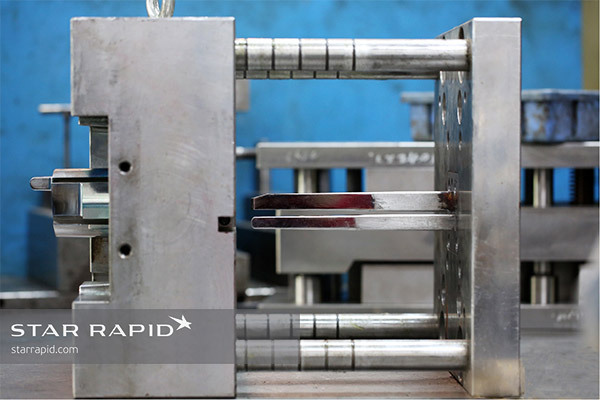 In a conventional mold tool, heat is controlled with coolant that flows throughout the mold in linear channels. These paths are made by drilling straight holes, and they have their limitations when molding complicated shapes. To improve this process, we’ve been conducting research and development to explore conformal cooling using our metal 3D printing service. Conformal cooling means that the channels can be designed to follow the shape of the part. These channels “conform” to any shape for optimum efficiency. Due to the limitations of subtractive manufacturing, only 3D metal printing can make them. 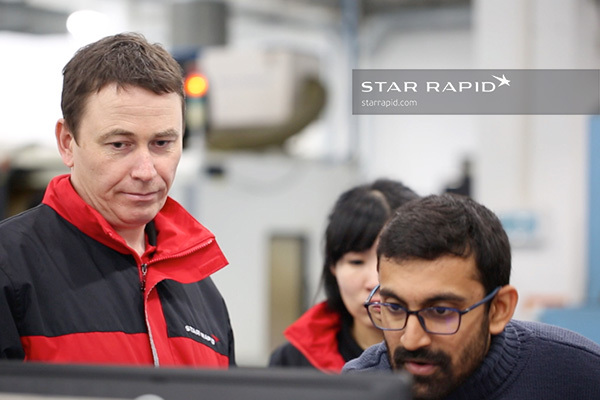 Our team at Star decided to start researching conformal cooling to test how it can provide our customers with an even faster and more competitive service. We partnered with our clients at Marco Beverage to remake their hot water reservoir using conformally cooled plastic injection molding tools. 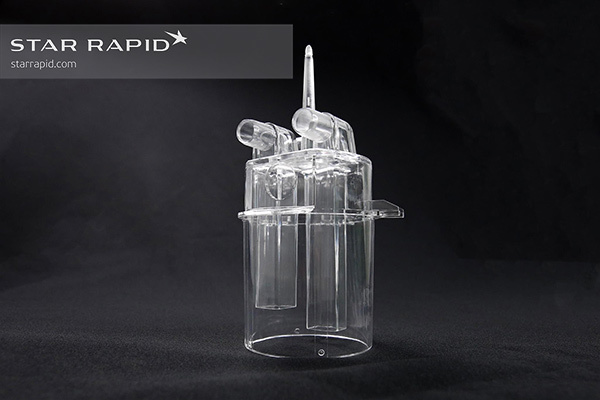 We felt that conformal cooling would further improve their product so it made a great candidate for further study. 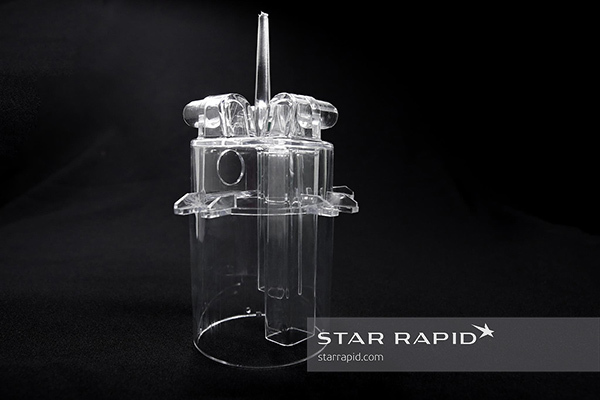 The reservoir is a clear plastic dispenser used for high-end water boiling and coffee making machines. You can read about how the original prototypes were made in this case study. To conduct the research, we partnered with Renishaw, the maker of our DMLM AM250 powder bed printer. They provided engineering support for the technical design of the 3D printed core. 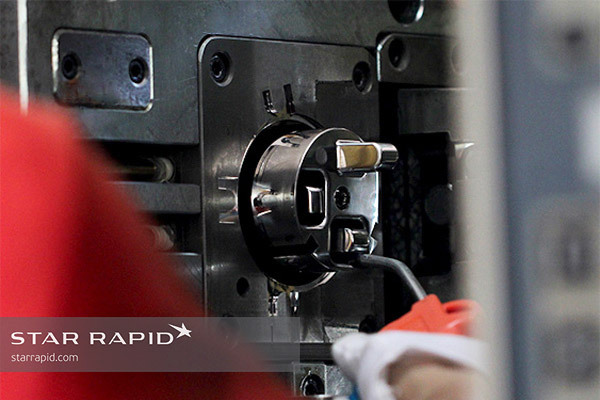 Working closely together, we created a solution that greatly reduced the cycle time while improving quality. 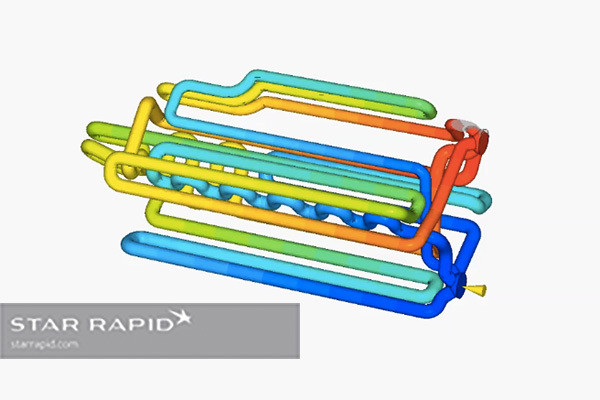 This case study presents our findings and shows how conformal cooling can enhance the performance of plastic injection molding tools. Engineers, tool makers and designers worked closely together to perfect the mold. 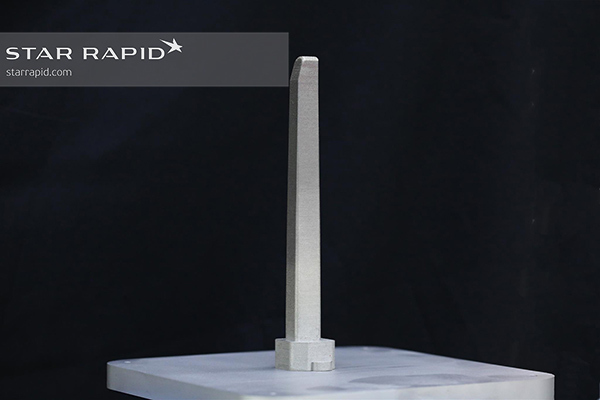 To measure the effectiveness of this approach, we first tried to maximize the performance of our conventional mold tools. This would establish a benchmark for later improvements. 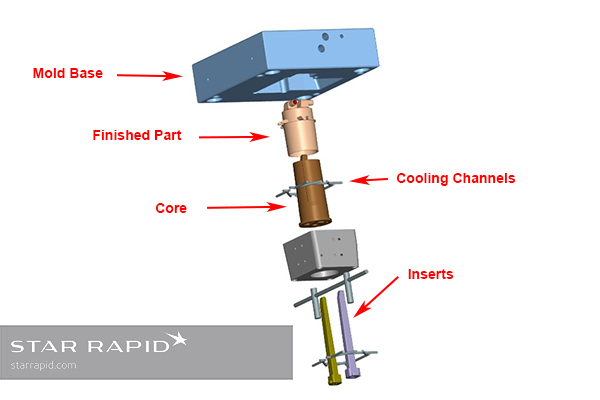 A simplified view of the conventional tool with straight cooling channels. To make the internal water supply columns for the reservoir that are such an integral part of this design, two molding inserts were required. In the conventional tool the cooling channels were drilled out and a baffle inserted not quite to the end of the hole. This left a gap at the bottom, creating a return circuit for coolant. You can see that the size and shape of this channel is not ideally suited to the insert’s outer walls where the coolant is most critically needed. A baffle was inserted into the straight hole to create a return path for coolant. COOLING TIME 60 sec. 60 sec. 22 sec. TOTAL CYCLE TIME 100 sec. 100 sec. 66 sec. After several cycles, the water temperature at the insert location rose from 14° C to 65° C. This created a visible “lake mark”, which is a pooling effect created when hot plastic continues to flow after the mold is opened. The lake mark is formed because the tool insert is still too hot when the mold is opened. 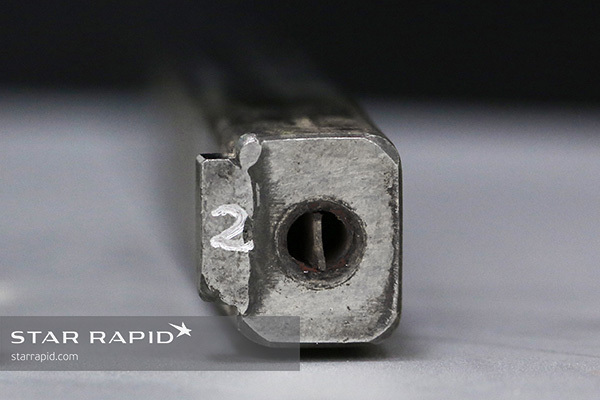 To cool the mold, compressed air was blown onto the inserts for 1 ½ minutes before removing the part. This lowered the temperature to approximately 35° C. The resulting parts had a slightly improved surface finish, but still some distortion. For volume production this extra time would add significantly to cost. To further cool the inserts, compressed air was sprayed on it for 2 minutes, reducing the temperature to approximately 30° C. This once again improved the finish quality slightly, but it was far from ideal. It was decided between ourselves and Renishaw to use metal 3D printing to make new inserts with conformal cooling channels. These would take longer to produce than their conventional counterparts, but the costs can be recouped over time by improving cycle times and product quality, thereby lowering production costs for large volumes. 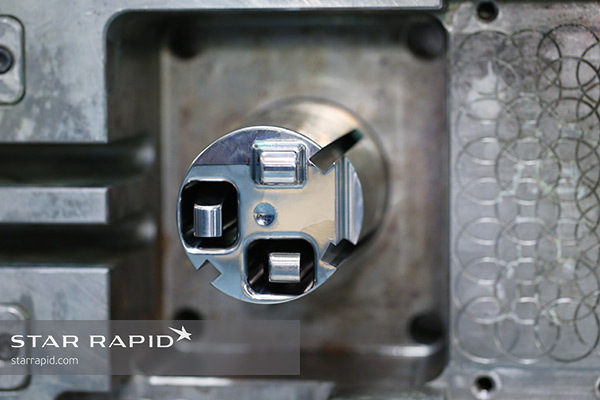 The conformal cooling channels were designed to closely follow the contours of the part, while staying close to the internal walls of the tool for greater efficiency. The inserts were printed from maraging steel on a Renishaw AM250 printer, starting from the base and working up to the top. The inserts were printed from maraging steel and oriented vertically on the print bed of our powder bed metal printer. Vertical printing avoids the need for additional supports and also prevents the holes from collapsing. Vertical orientation helps avoid the need for additional part supports. After printing, the parts still had a rough surface texture, so the inserts were later sanded and polished to a high gloss. 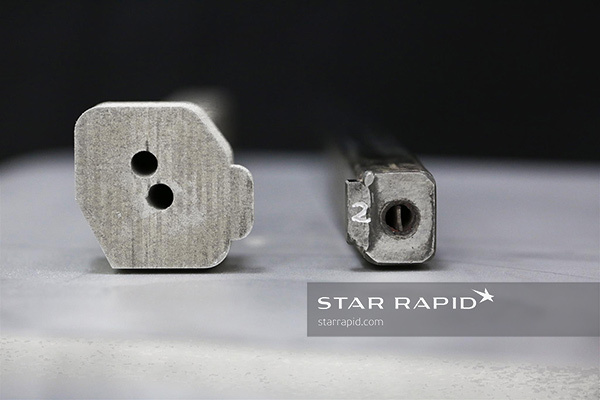 Although the total volume of coolant is roughly the same between the original insert and the new one, the 3D printed channel follows the taper of the tool more closely, and has a greater exposed surface area against the tool wall. For the second series of tests, the input water temperature was stepped up in increments, from 15°to 20° to 60°. This was an attempt to equalize the temperature differential between the molten resin and the mold. For each increase, we recorded the resulting temperature at four places: the 3D printed inserts, the core, the mold base and the mold cavity. These recordings were taken on the 1st, 4th and 8th cycles respectively. 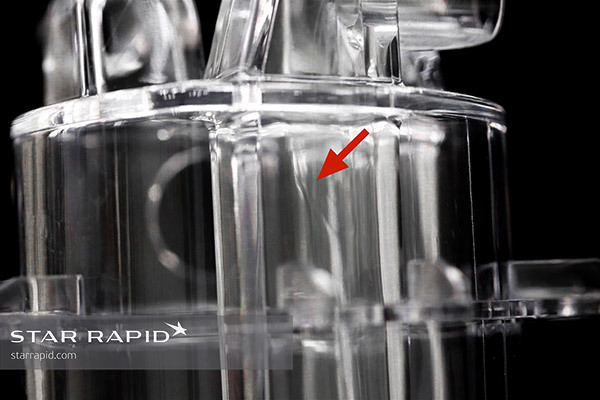 The 3D printed inserts, the mold base and the cavity maintained a temperature consistent with the corresponding input water temp., with only a 1~2° C fluctuation. However, the temperature of the core increased more than 25° C above the water supply temperature. It became apparent that this was the primary cause of the heat-related defects on the surface of the plastic. To address this problem we decided to make 3D printed conformally cooled cores. 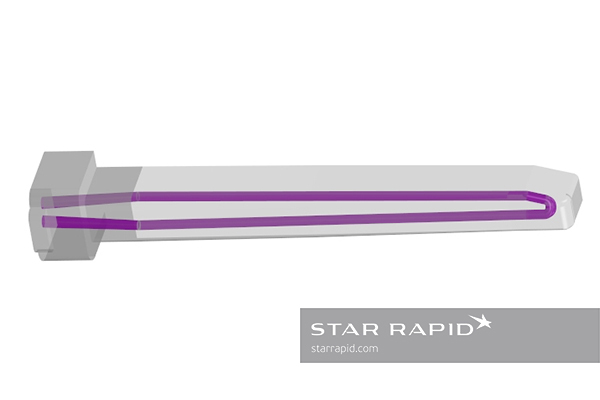 Two different CAD designs were created for the cores – one by Star Rapid’s engineers and one from LBC Engineering. LBC specializes in advanced design solutions for complex 3D printing challenges. 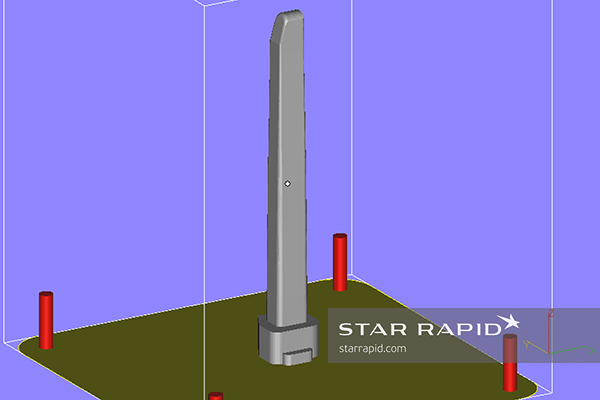 Star’s design improved cooling efficiency, but the location of the channels didn’t leave enough room for other supporting architecture in the mold. 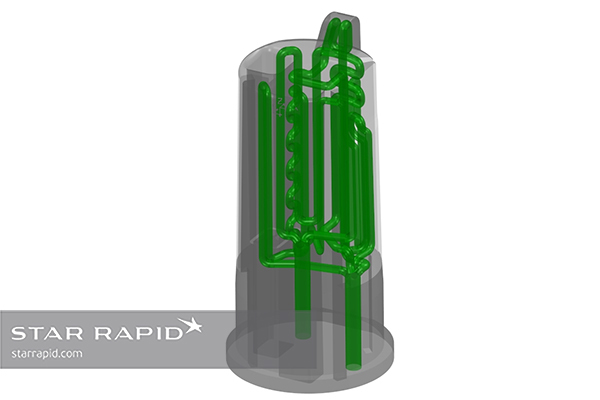 Sophisticated modeling software was used to optimize this design from Renishaw and LBC Engineering..
LBC Engineering is a subsidiary of Renishaw specializing in consultancy for complex additive manufacturing designs. Mold flow analysis helped us to track how heat would be transferred through the cooling circuits. 3D printed cores and inserts mounted onto the plastic injection molding base plates. We mounted the inserts on the B-Side of the plate, above right. This is the plate that opens and closes for each cycle. The A-side on the left held the core, which remained fixed during each molding cycle. The mold in its fully closed position. It was important for us to carefully polish the outer surface of the tools. This created a glossy finish on the transparent parts and it also helped the parts to slide off the tools easily after molding. 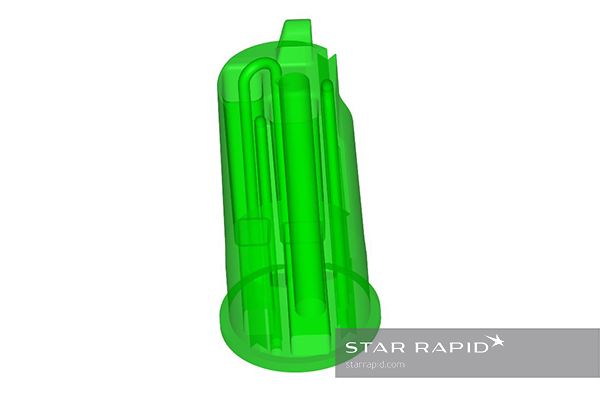 With the new injection mold tools we conducted a series of test runs to gauge our results. We found that the 3D printed cores and inserts performed significantly better than conventional mold tools. How much better? The best results were achieved with a cooling time of 22 seconds. Not only was conformal cooling able to help us greatly improve the product quality, but we also reduced the cooling time by 38 seconds, or 60%. This completely removed the need for additional manual air cooling. This reduction in cycle time can be a significant cost-savings for longer production runs, and may go a long way to offsetting the relatively larger expense that comes from developing such a tool. We will continue to work with Renishaw and LBC Engineering in the future to refine this process for future advanced applications. Want to know more? Upload your CAD drawings for a free quote or contact us to talk with one of our specialists.